The Curly-Que Snapping Shrimp may form a symbiotic relationship with Curly-Que Anemones. It is found in a variety of colors and sizes. Snapping Shrimp are not easily sexed, but the males of many species are thought to have a larger pincher. The sound it makes comes from an appendage on the pincher which moves when the pincher is opened or closed and water is ejected. The Curly-Que Snapping Shrimp can be easily confused with Mantis Shrimp if judged by sound only. Unlike the Mantis Shrimp, it is not harmful and will not pose any threat in the tank, with the possible exception of smaller shrimp. The name Symbiotic Shrimp comes from the equally beneficial relationship the Snapping Shrimp may form with gobies, anemones, sponges or corals (e.g. ;Amblyeleotris or Stonogobiops). The shrimp share its food with other species. It is beneficial to the tank as it churns the sand. It thrives in environments with sand, rock caves, and dim light. If in pairs, one will often stand guard at the burrow while the other is inside. 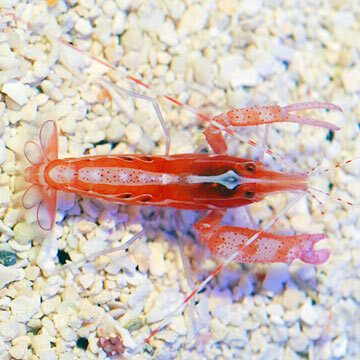 The Curly-Que Snapping Shrimp is intolerant of copper or high nitrate levels, but needs a correct level of iodine in the water to promote proper molting. Curly-Que Snapping Shrimp will accept freeze-dried and frozen foods and bottom feeder tablets, as well as scavenge for algae in the aquarium. Approximate Purchase Size: 3/4" to 2-1/2"
I rarely see mine except when feeding, though I hear it snap whenever my wrasse gets too close to his lair. Very easy to see where they set up "home". Nice clean tunnel with a pile of sand at entrance and a little hole to escape at back of tunnel. The Pistol Shrimp is one of the most interesting invertebrates in my aquarium. It loves to build caves under the rockwork and interact with my Watchman Goby. I recommend this species to anyone who wants to add a new level of diversity to their saltwater aquarium. My Pistol Shrimp is a real character. He tunnels so much in the sand that our live rock keeps shifting places in the tank. I give him feedings of frozen shrimp pieces which he carries around the tank and sometimes buries in the tunnels. Only thing I'd recommend is to get a different species which has same personality but more color. Beautiful shrimp, but may more aggressive than advertised. I purchased two (one for my boyfriend's tank and one for mine). His snapping shrimp is a model citizen and churns the sand near his cave nightly. Mine was sumped within a day due to aggression towards other shrimp, snails, and fish (he actually took a chunk out of both my anthias's tails). I would highly recommend only one per a tank.